Tapas Bar and Market in Williamsburg! 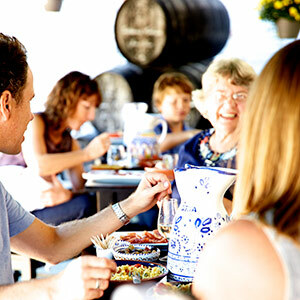 Celebrate Spain at the La Tienda tapas bar and gift shop! Just miles from Colonial Williamsburg, we welcome locals and travelers alike. 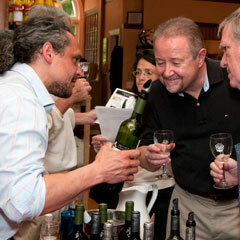 Discover a great wine and browse handcrafted cheeses and cured meats, paella supplies and artisan foods of Spain. Stroll over to our tapas bar for freshly made tapas and paella and a glass of wine, a gin tonic or a cup of our famous house sangría! La Tienda Tapas Bar - Open Tuesday thru Saturday! Discover the taste of Spain at our tapas bar! Open for lunch and dinner Tuesday through Saturday. 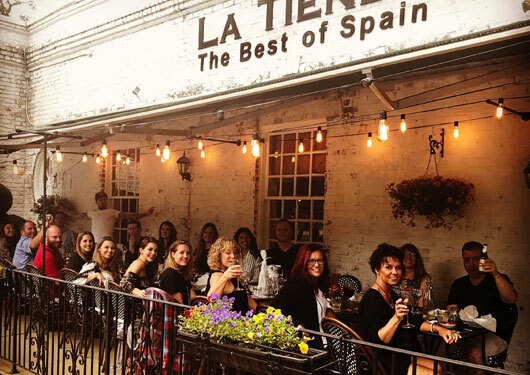 Featuring authentic paella and tapas, great Spanish wines and our famous house sangria. Reservations recommended. Join us every Saturday from 1pm-4pm for a free tasting of wines from across Spain! Hosted by a knowledgeable wine expert, you can discover a favorite new wine while nibbling on complimentary Spanish tapas. From 64W take exit 242A. Follow 199W for 5.5 miles, then turn LEFT onto Jamestown Road. La Tienda is 0.3 miles on the right, immediately after Colony Square Shopping Center. From 64E take exit 234. Turn right onto 199E, then turn RIGHT onto Jamestown Road. La Tienda is 0.3 miles on the right, immediately after Colony Square Shopping Center. Please note: Products purchased at La Tienda’s Williamsburg store can only be returned at the store. For retail store returns and exchanges, please contact the store directly at retail@latienda.com or (757) 253-1925. Our store inventory and sale pricing may differ from that available on our website.